Boho or bohemian style is inspired by the fashion trends of the 1960's and 1970's. This beautiful wrap bracelet is for those people that are artistic and creative in their fashion styles. Have some fun and channel your inner hippie when wearing this piece of jewelry. The paper beads take some time to make, but once they are finished you can string together the bracelet in under five minutes! Download the purple bead PDF paper bead printable. Print the paper bead template onto ordinary computer paper. Cut 12 purple paper bead squares using an Xacto knife and ruler, or scissors or a paper cutter. The choice is yours. Cut the template with whatever cutting tool you are most comfortable using. 4. 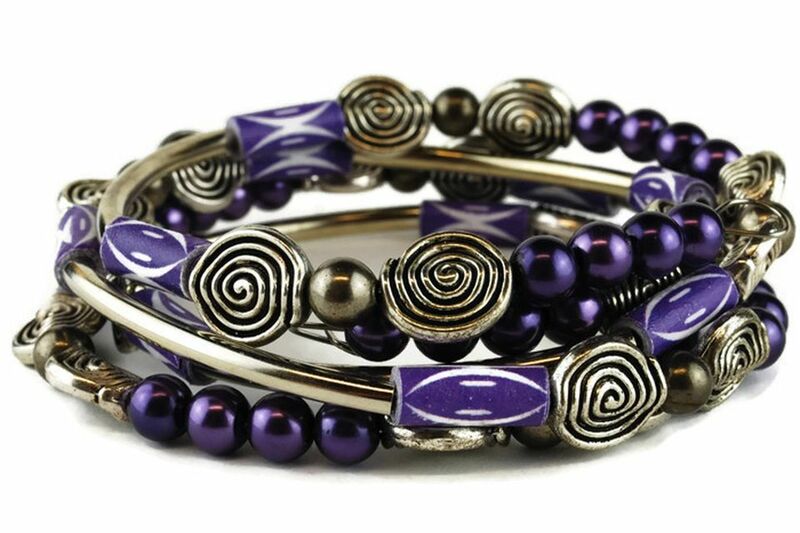 Apply a bit of glue to the open purple end of the printed purple paper bead template. 5. Roll the paper bead template around a wooden toothpick. 6. Apply some glue with a glue stick on the end of the bead roll to secure the paper bead. 7. Remove the wooden toothpick after the glue has dried. 8. Continue the process until you have made 12 purple tubular paper beads. 9. After the glue on the paper beads has dried, it is time to dip the beads into the liquid PC-Petrifier Wood Hardener. This formula works exceptionally well with paper beads. Once the beads have been dipped and dried, they are rock solid and glossy. If you are the type of person that does better with visual instruction, make sure to check out this YouTube video. Always make sure to use common sense when working with PC-Petrifier Wood Hardener. Wash your hands thoroughly if the solution comes into contact with your hands, and never have the solution come into contact with your eyes. Severe damage can occur if the solution comes into contact with your eyes. 10. Using the round nose jewelry pliers form a loop at one end of the memory wire coil. 12. Place six sets of the beads as in the photo above onto the memory wire and then end with four more purple beads. 13. Pull the beads tightly onto the memory wire so that there are no spaces in between the beads. 14. Using the Round Nose Plier for Jewelry Making form a wire loop on the other end of the memory wire bracelet. 15. Trim any excess wire from the end metal loop with the cutting pliers for jewelry making. That is it! Your beautiful boho style memory wire wrap bracelet is now finished. It is such an easy craft project that you will want to make many more for your self and your friends as gifts. Gotta love it!